Do you find yourself waking up in the morning with jaw pain or restricted jaw movement? Do you notice your teeth appearing flatter and more worn down? Do your teeth feel sensitive? Do you often suffer from routine headaches? Any or all of these symptoms can be signs that you suffer from bruxism. Bruxism is the medical term for grinding teeth or clenched jaws. According to the American Dental Association, 10-15% of adults are affected by bruxism. So what can I do if I think that I may suffer from bruxism? First you should consider getting evaluated by your Aspen Creek Dentists to determine whether or not you are showing the signs and symptoms of bruxism. They will then decide if you would benefit from wearing a dental night guard. 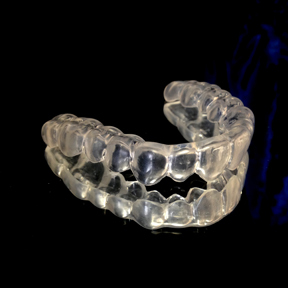 Dental night guards made at Aspen Creek Dental are custom fit to every individual’s mouth. Your dentist will decide which type of night guard will best suit your needs; whether it is a soft or hard acrylic guard or whether it covers all of you teeth or just some of them. The first appointment will consist of taking impressions of your upper and lower teeth. You will then receive your night guard at your second appointment and your dentist will make adjustments if needed to comfortably fit your mouth. The great thing is these night guards are usually covered by most dental insurance companies. Will I notice any difference after wearing my dental night guard? In our experience, patients at Aspen Creek Dental seem to notice a big difference and actually prefer to wear their custom fit night guard after seeing the results they have with it. However, getting the night guard is only half of the solution. In order to notice the effects of the appliance you have to wear it. A night guard that collects dust on your night stand isn’t doing much! 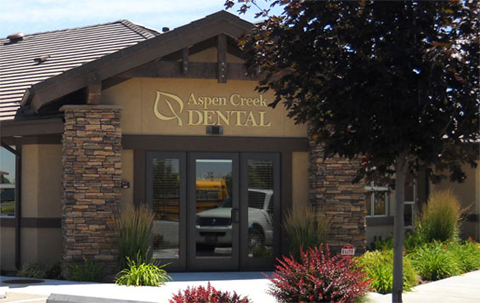 Come visit your Aspen Creek dentists today to see if a dental night guard can benefit you!